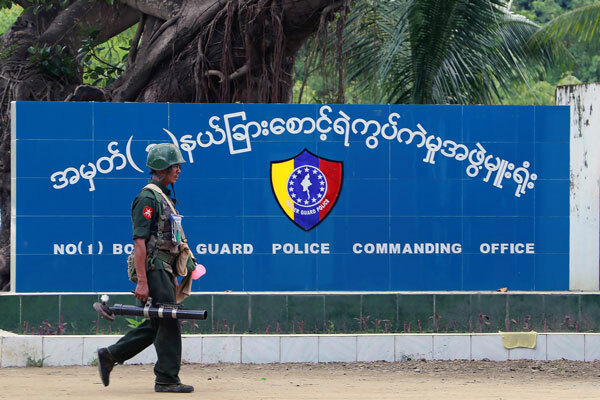 YANGON -- Myanmar's police court has sentenced three senior officers to prison for negligence after Rohingya insurgents overran three border posts in October, killing nine policemen, a government official said on Friday. Several hundred Rohingya men, from a Muslim minority that many in Buddhist-majority Myanmar view as illegal immigrants from neighboring Bangladesh, attacked the border guard posts on Oct. 9. Most were armed only with sticks. The attacks set off a crackdown on the minority, prompting more than 70,000 people to flee across the border to Bangladesh. Information Ministry director Ye Naing told Reuters an official investigation probed how the poorly trained and barely armed insurgents could successfully stage the attacks. The government says the militants, who stole weapons and ammunition in the raids, have links to radical Islamists abroad. The court sentenced the three senior officers in the border town of Maungdaw to one to three years in prison, Ye Naing said. "They were jailed because they were guilty of negligence regarding security during the Oct. 9 attacks," he said. Ye Naing could not specify the date of the sentencing or details of the investigation. Several other high-ranking police officers were still under investigation by the military-controlled Ministry of Home Affairs, he added. About 1.1 million Rohingya Muslims live in apartheid-like conditions in northwestern Myanmar, where they are denied citizenship. The United Nations has documented mass killings and rapes committed during the crackdown by security forces that it says may amount to crimes against humanity. No senior police or army officers have been found accountable for these alleged crimes. The civilian government led by Nobel laureate Aung San Suu Kyi has repeatedly denied almost all allegations against the country's still-powerful armed forces during what it has said was a lawful counterinsurgency campaign that began in October.